Well, folks, HTC's 2015 flagship is here – the HTC One M9 was announced just a couple of days ago, at the MWC, in its full metal glory. While it doesn't look very different on the outside, it certainly got a few notable upgrades under its hood, which should keep it well in the game this year. HTC One flagships have been getting a lot of praise for their premium metal unibody design and, since the One M9 keeps a lot of the looks of its predecessors, we expect that it would still have its fair share of fans. So, since we're here and have our chance of a hands-on, of course we wouldn't miss to compare it to another premium-looking handset, which has its fair share of devoted followers – the Sony Xperia Z3. Both handsets are beautiful, there's no denying that. The Xperia Z3 is sporting a metal chassis, sandwiched between two glass panels, and impresses with a slim, rounded, balanced look. All of its openings, except for the headphone jack and the speakers, are hidden by flaps, which serve both as protectors against dust and water ingress, and give the phone a slick, unified surface appearance. Its front houses two stereo speakers, hidden behind two slim grilles, positioned at the top and bottom of the 5.2” screen. 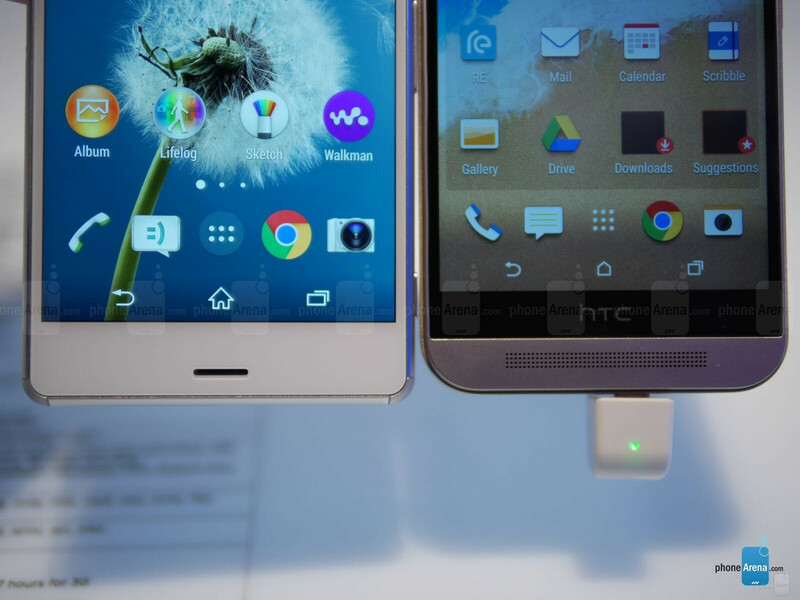 The HTC One M9 remains largely unchanged in appearance, compared to the (M8) before it. It still sports a metal unibody shell with an arched back, which we found to be slightly less slippery than the material on the older model. This year's HTC flagship adds a dual finish to the design – a gold stripe accent across its rim, which we think adds a bit of a harsh edge to the looks of the device, but the overall appearance does seem to freshen up a bit. The handset, of course, sports HTC's BoomSound stereo speakers housed in the top and bottom bezel, which elongates them a bit, but the general consensus is that the improvement of sound quality is worth it. Sony refused to hop on the QHD bandwagon with the Z3, sticking firmly to the idea that putting a strain on hardware and battery is not a price it wants to pay for upgrading a PPI density that's already pretty crisp anyway. The Xperia Z3 has a 5.2” Triluminous (ISP LCD) display with a 1080 x 1920 resolution, which results in 424 pixels per inch – one would be hard-pressed to discern individual pixels on the screen. In our review, we found the screen to be quite bluish, but thankfully, Sony added an RGB setting for users to play around with, which allows anyone to set the picture to satisfying levels. HTC, interestingly enough, also sticked with with the 1080 x 1920 resolution, stretched across its 5” IPS LCD display, resulting in 441 PPI. The screen-to-body ratio of the One M9 is still slightly disappointing – 68.52%, while we find that modern flagships try to keep this ratio to above 70% to adhere to contemporary looks standards. 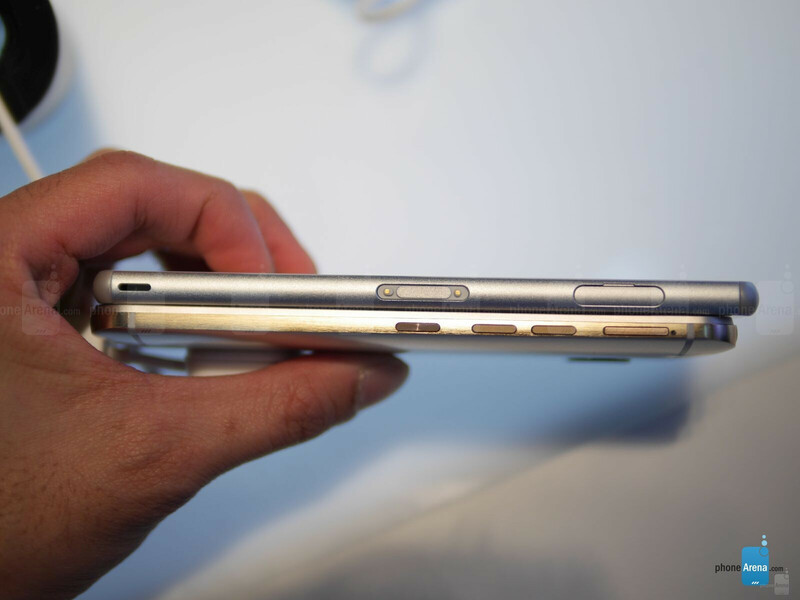 Still, the HTC's rounded-off design does not make the chassis look too bulky or cumbersome. Sony's UI is quite a light take on Android reskinning. Sure, things look different, as it replaces stock icons and settings menus, but it is in no way feature-ridden or bogged down by an excessive amount of processes, which the user may or may not know about. The experience is intuitive and the interface is mainly clean and minimalistic. Still, it looks slightly outdated, especially since the mobile world is moving towards flat, borderless looks, and Sony is still stuck with the skeuomorphic looks. HTC's One M9 rocks the latest Sense 7 UI – an Android reskin, which also keeps things to-the-point. A few minor tweaks here and there, but no major overhaul or feature-filling keeps the interface simple, light, snappy, and intuitive. It has a hint of Material Design, but doesn't adhere to Google's “flatness” too much – HTC wanted to keep a hint of their own look, it appears, which is not a bad thing as the interface is easy one the eyes and keeps things easy to find. The Sony Xperia Z3 rocks a quad-core Snapdragon 801 SoC – the now aging CPU of choice for last year's flagships. It's coupled with 3 GB of RAM and the phone has 16 GB of internal storage, which is expandable via microSD up to 128 GB. Even with last year's specs – the handset still has enough power under its hood to carry out the heavy tasks today's users may throw at it. The HTC One M9 rocks the latest and greatest from Qualcomm – the 64-bit octa-core Snapdragon 810, 3 GB of RAM, and 32 GB of microSD-expandable internal storage. Naturally, its processor and GPU are a step above the Xperia's, but as far as other specs go – the two handsets are pretty similar. Naturally, the HTC is more future-proof, due to it being ready for the 64-bit era, and having that extra power headroom, which the Xperia will slowly, but surely, run out of in the following year or two. Sony's Xperia Z3 sports a 20.7 MP sensor with an F2.0 aperture under its hood, which we found to take naturally-colored photos with medium amounts of detail – not the best snapper right now, but a pretty potent one none the less. Unfortunately, users have been complaining about a pink blotch appearing in their snaps on both the Xperia Z3 and Z3 Compact in certain lighting conditions, so we can't really tick Sony's camera as 100% reliable. HTC decided to do away with the UltraPixel tech for its main snapper – the company used to stick 4 MP worth of larger-than-normal sensors in its camera sensors, claiming that it helps with low light shot, but the results were generally underwhelming. Well, the M9 now sports a 20 MP camera with an F2.2 aperture – now that's a nice jump up from last year's model. Our time with the pre-production model showed promise, but we'd hold out on a final verdict until we've had some real time to play with the new flagship at a later date. You can check out the snaps below (or check out more here). As far as UltraPixel tech – it's not completely gone – it is now used for the front-facing camera of the One M9 and, we have to say, we like the idea, as this promises better low-light selfies and video conversations. The HTC One M9 will grab the interest of users, there's no doubt about that. Just a subtle touch-up here and there and a few upgrades, which will keep the phone in the game throughout 2015 are probably all that the One needed, as it is currently pretty loved by users. The Sony Xperia Z3 still has fight left in it – it may sport last year's hardware, but its minimalistic interface keeps things on the light side and users will not feel like their handset is infested with stutters. As far as apps go, we'd wager there's quite some time left before developers start making content that refuses to play on the still potent Snapdragon 801. Both are aweome android phone. Android most beautifully crafted phones are these. But I prefer HTC's design and UI over Sony. So I'll take M9. I agree with Kumar123, both looks great. I prefer unmistakable look of Z series though, new Lollipop Sony UI looks really close to stock as well. I was talking about build. But Yes, HTC's UI really looks great. Those images didn't impress, but that might change in a proper rew however. Enable Manual Mode and then take pictures with the Z3. Performance scores doesn't mean shyt. I rather have a water proof over any other phone.